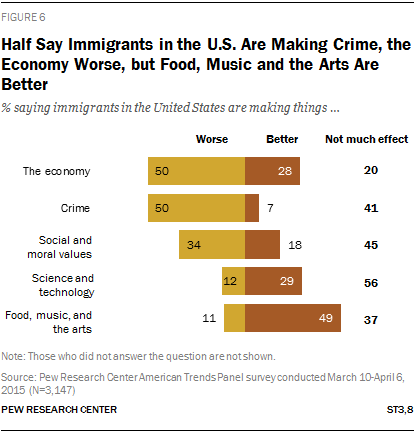 Immigration Is Remaking America. Is That What We Want? At the time, relatively few anticipated the size or demographic impact of the post-1965 immigration flow. In absolute numbers, the roughly 59 million immigrants who arrived in the U.S. between 1965 and 2015 exceed those who arrived in the great waves of European-dominated immigration during the 19th and early 20th centuries. Between 1840 and 1889, 14.3 million immigrants came to the U.S., and between 1890 and 1919, an additional 18.2 million arrived. No doubt many of those who think immigration is hurting our economy are speaking from experience; that is, they can see that it is harder for native-born Americans to find jobs. Politicians ignore this consensus at their peril. Pew’s projection, based on current trends, is for a population of 441 million in 50 years. This has got to be extremely conservative: it is a compound growth rate of only 5/8 of 1%. The actual population growth rate over the past 25 years has been 1%, overwhelmingly, as the Report shows, from immigration. If the growth rate over the next 50 years is midway between these two rates, about 7/8 of 1%, then the population impact is that much greater, to a total of 500 million! 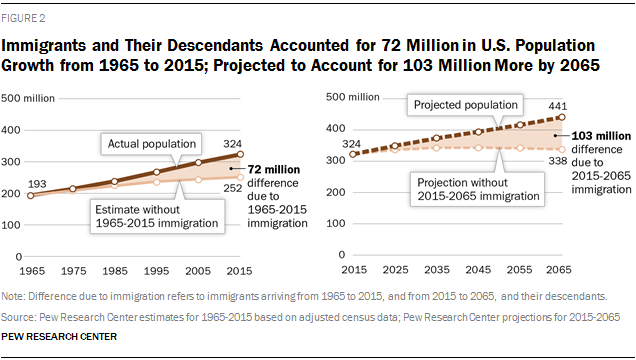 If the growth rate simply matches the immigration driven growth rate of the recent past, population in 2065 would be 535 million. And this assumes no Gang of Eight immigration “reform” which would essentially double current levels of immigration. Add another 50 million, more or less. At a minimum, over my children’s lifetime, the immigration celebrations are planning on adding a minimum of 120 million in increased population–the entire population of the United States in 1920! More likely, the increase is in the vicinity of 180 million, the entire population of the United States just before the disastrous 1965 Act!! This is simply gargantuan. Where do they suppose we are going to put the equivalent of the entire population of the U.S. as of 1960 between now and 2065? Next to where they live? In the Hamptons, perhaps? Or Marin County, California? Maybe the pristine little New England towns in the suburbs of Boston? Montgomery County, MD? Westchester County, anyone? How about Martha’s Vineyard or Hyannisport?…plenty of room! Actually, Madeline Albright smugly pointed out that from her airplane window, flying coast to coast, she could see that there was lots of room–in the Midwest! Plenty of space for another 150 million or so, right there! Hey!….isn’t that where you live?! But this is one subject on which the elites don’t care what we want. Immigration will be the number one issue in the 2016 presidential election, and the candidate who takes the most restrictive position will have a huge advantage.